".... the damn doctor wouldn't take her off it and I asked him to when we went in on the second visit. I told him I thought she was having some sort of reaction to Paxil [also known as Seroxat and Paroxetine] but nothing was indicated on the printout sheet that we received with her prescription. The third visit I even asked him to put her in an in-patient clinic to get her off it and maybe try something else, if anything at all. I wanted her watched round the clock by so called professionals so that they could get her on the straight and narrow quicker. He told me there was no need to put her in an in-patient clinic unless.. He then turned round to Kara and asked her if she felt like hurting herself or anybody else. She said 'No'. He then continued speaking to me stating that there was no need for her to be in the clinic......"
"Child of the Universe no Less than the Trees and the Stars." She is now just a 'statistic' alongside very many others. She had "a right to be here." GLAXOSMITHKLINE - WHAT HAVE YOU DONE! 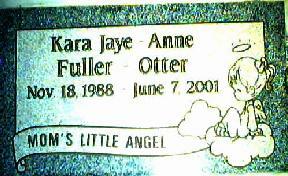 THIS WEBPAGE IS DEDICATED TO MY ONCE LOVING & BEAUTIFUL DAUGHTER, KARA JAYE-ANNE OTTER. KARA WAS A BEAUTIFUL, LOVING AND SPIRITED CHILD WHO I USED TO WATCH IN AWE. SHE HAD AN AURA, A LIFE FORCE THAT I'VE NEVER SEEN BEFORE IN A CHILD. SHE WAS A SURVIVOR, OR SO EVERYONE THOUGHT, INCLUDING KARA HERSELF. SHE WAS A BORN LEADER, SOMEWHAT MISCHIEVEOUS AND OUTSPOKEN. SHE ALWAYS STOOD OUT IN A CROWD. AFTER YOU MET HER ONCE YOU MAY NOT HAVE LIKED HER, BUT YOU WOULD REMEMBER HER. SHE HAD AN AMAZING CONNECTION WITH ALL ANIMALS AND SMALL CHILDREN. SHE HAD THAT SPECIAL LITTLE SOMETHING THAT ONLY A VERY FEW INDIVIDUALS HAVE. KARA HAD THOUGHTS ALREADY OF BECOMING A METEOROLOGIST AND CHASE TORNADO'S WHEN SHE WASN'T REPORTING THE WEATHER ON A TV STATION. SHE WANTED 3 BOYS AND TO DRIVE A DODGE DURANGO. SHE WAS LOOKING FORWARD TO STARTING MODELING AT THE END OF JUNE. SHE WAS THE CENTER OF OUR FAMILY. SHE WAS THE FABRIC THAT HELD US TOGETHER. KARA LEFT THIS EARTH ON JUNE 7TH 2001 WHILE WITHDRAWING FROM PAXIL. SHE HAD BEEN TAKING PAXIL FOR 8 MONTHS WHILE WE CONTINOUSLY REQUESTED THE DOCTOR TO DISCONTINUE THE DRUG BECAUSE IT SEEMED AS THOUGH IT WAS DRAINING THE VERY LIFE RIGHT OUT OF HER. KARA SHOWED SIGNS OF WHAT WE KNOW NOW IS CALLED AKATHISIA THE LAST DAY OF HER LIFE. I CANNOT POSSIBLY EVEN BEGIN TO PUT INTO WORDS OR EXPRESS THE SORROW AND GRIEF THAT ONE TINY LITTLE WHITE PILL HAS BROUGHT INTO OUR LIFE'S AND WHAT THAT ONE TINY WHITE PILL HAS TAKEN FROM OUR LIVES... THAT PILL HAS A NAME... IT'S NAME IS PAXIL. NOR CAN ANY WORDS TELL HER STORY AS WELL AS HER PICTURES OF THE LAST 8 MONTHS OF KARA'S LIFE CAN. THEY SAY A PICTURE CAN SAY A THOUSAND WORDS. CAN YOU HEAR? FIND OUT TODAY WHAT THE DRUG MANUFACTURER HAS KNOWN FOR YEARS AND HAS BEEN HIDING FROM PUBLIC, ESPECIALLY IN THE PEDIATRIC POPULATION CONCERNING THESE DRUGS. FIND OUT THE HIGH RATE OF SUICIDE AND/OR VIOLENCE THAT PAXIL AND OTHER SSRI'S, -SUCH AS PROZAC, ZOLOFT & EFFEXOR JUST TO NAME A FEW- CAN INDUCE IN INDIVIDUALS BEING PRESCRIBED THESE DRUGS. THE FACTS YOU FIND OUT TODAY WILL SAVE THE LIFE OF SOMEONE YOU LOVE TOMORROW. DON'T LET THIS HAPPEN TO YOU OR SOMEONE YOU LOVE. WE WERE FORCED TO MEDICATE KARA AND LATER FOUND OUT THAT THE SCHOOLS NEEDED SO MANY MORE SPECIAL ED RECIPIENTS IN ORDER TO RECIEVE MORE FUNDING FROM THE STATE AND ALSO THAT HER PSYCHIATRIST HAD BEEN DOING HIS OWN CLINICAL TRIALS ON CHILDREN RECIEVING FUNDING FROM THE PHARMACEUTICAL COMPANY. WHO IS PROTECTING OUR CHILDREN? WHO IS PROTECTING THE FOSTER CHILDREN? CHILD PREDATORS ARE CLOSEST TO OUR CHILDREN . THIS VIOLATION OF HUMAN RIGHTS IS HAPPENING DAILY. HELP STOP THE SYSTEM USING OUR CHILDREN AS HUMAN LAB RATS WHO ARE NOTHING MORE THAN A STATISTIC, AN ANECDOTE. HELP US FIGHT FOR THEIR LIFE'S. IT IS TO LATE FOR KARA, BUT IT IS NOT TO LATE FOR YOUR CHILDREN. MAKE AN EFFORT IN MAKING YOURSELF & THE PUBLIC MORE AWARE. DEMAND THE HIDDEN CLINICAL TRIALS THAT THE DRUG COMPANIES REFUSE TO RELEASE ON CHILDREN. IT'S BECAUSE THEY ARE ALL NEGATIVE. DON'T LET ANOTHER CHILD SUFFER SUCH A SENSELESS & NEEDLESS DEATH. PLEASE DON'T LET ANOTHER CHILD FALL VICTIM TO THESE DRUGS. FIND OUT THE TRUTH. KNOWLEDGE IS POWER.